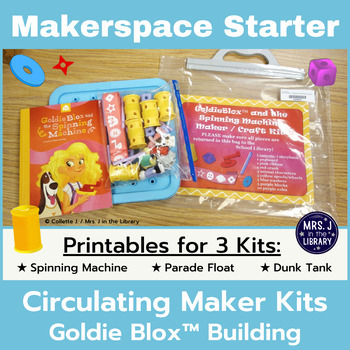 Help your students become makers and creators at home and at school by adding circulating maker / craft kits to your school or classroom library! 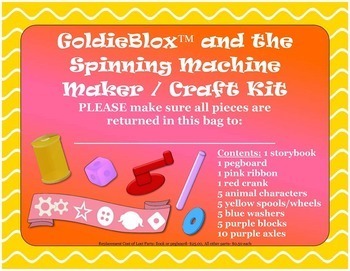 This zip file includes 15 pages of materials to create 3 GoldieBlox™ kits that can be checked out by students. 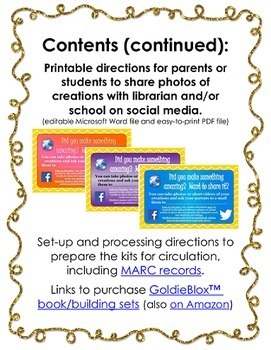 When using the kit at home, parents and students are given the opportunity to take photos and email them to the teacher or librarian to post to social media. It’s a great way to connect home and school learning! Download the preview for full contents. If you aren’t familiar with the maker movement or makerspaces (also called DIY spaces or hackerspaces), I’d recommend downloading the preview and doing your own research on makerspaces and the Maker Faire. 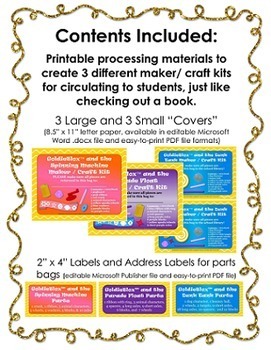 I’ve found the “Makerspace Playbook” by MAKE: magazine to be very helpful.